Steve Drewery from Outback Autos (01485-520394) tells us how to make a pick-up truck from pieces of Bongo that you may have found in your back garden. 1) Identify your perfect Bongo or Freda (in this case, a green one) and then cut it up in to bits. 2) Once you’ve got rid of the tall bit on the back, stitch it back together again. 3) Now add some old radiator pipes. 4) Finally, get some of that silver foil stuff that they put on the blankets that they give knackered runners at the end of the London Marathon. 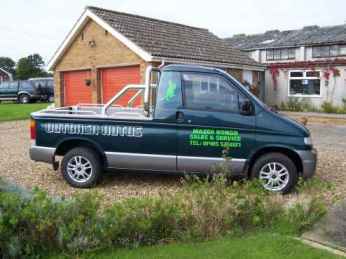 And hey presto!, you have a Bongo pick-up truck!